Today I ran, biked, and swam in my first triathlon. The Pasadena Triathlon is a reverse sprint, so the distances are much shorter than a regular (Olympic-length) triathlon, and the events occur in the reverse order. Our task for the day was to run 5 km, then bike 15 km, then swim 150 m. I was most worried about the swim, as that is certainly my weakest event right now! I arrived at 6:30 a.m., an hour and a half before the race start, and had no trouble setting up my transition area, where I would return between events to swap gear. It was very chilly at first, and we were all grateful when the sun finally came up. I was lucky enough to have two friends there to help the time pass quickly: Vali, my race buddy who was competing in the much-harder duathlon (5K run + 15K bike + another 5K run), and Evan, my triathlete friend who got me to sign up in the first place (and who took pictures and carried my stuff around and shouted encouragement at every turn!). The hardest part of the morning might have been the final 15 minutes before race start! I kept wanting to warm up, but not too much in advance, and itching to just get going. But finally we started off. At first it was slow going because there were so many people in the “women under 40” group, but we eventually spread out and the running felt great. I enjoyed following along behind two women who were wearing tutus (easy to spot!). The run was uneventful aside from one of the tutu-wearing women tripping in front of me. She recovered with a nice roll and was back on her feet immediately. After the run, I pulled on my helmet, gloves, and hydration backpack. I know the latter is utterly uncool, but since I was riding a mountain bike, I’d already given up any cool gear points. :) And the backpack worked great! I had all of my tire-changing supplies in there (thankfully never needed) and I never got too thirsty. Worth the weight, for me. I got brave enough to call out “Yay, mountain bikes!” to another woman riding one, and we had a brief breathless exchange (she also had a hydration pack, and she volunteered that she too most feared the upcoming swim!). Three loops around the Rose Bowl went by quickly on the bike — or it felt that way (it actually took more total time than the single-loop run). Each loop seemed to go faster than the one before, according to my bike computer, the opposite of what I expected. I zoomed back to the transition area and got my first surprise when I dismounted the bike. You’re meant to keep jogging so you don’t clog the dismount channel, but if I hadn’t been holding the bike as I staggered along, I’d have fallen flat on my face! My left leg immediately cramped and I couldn’t seem to move my legs properly. Everyone says that the bike to run transition is hard — I guess that’s what that was! Happily, I recovered by the time I got to my bike rack. I pulled off my helmet, backpack, shirt, and shorts, pulled on my swim cap, grabbed my goggles, and ran. It’s about 200 meters from the transition area to the pool, over rocks and grass, and I was so glad I’d left my sneakers on! Then it was into the pool, and I just went for it. I actually wasn’t as tired as I’d feared I’d be, and although the 150 meters were *long*, it was overall less effort than one of my standard 30-minute attempts at lap swims. I did have to alternate between the front crawl and swimming on my back, as I grew more tired, but I didn’t drown and I actually passed a person or two (!). 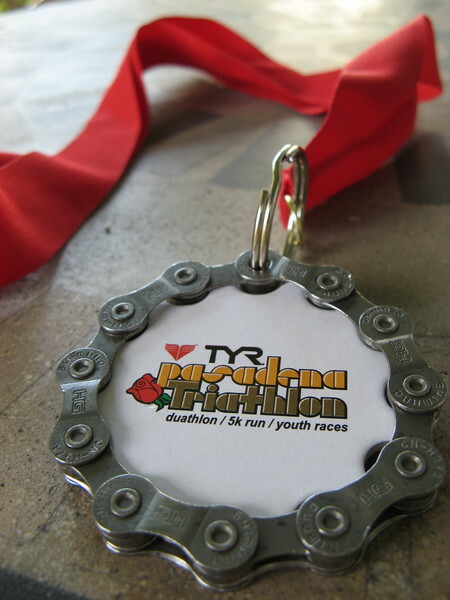 I staggered out of the pool and happily accepted my medal (a neat one with a bike chain around the perimeter!). Overall, it was a fantastic experience. I accomplished something I considered beyond my abilities just a few months ago. I really felt that my training paid off, and I was neither exhausted nor in pain at the end of the race. And contrary to what we’d been told to be prepared for, nothing went wrong! No gear failed, no important item was forgotten, I didn’t fall, I survived the swim. I could definitely see myself doing this again — and maybe even improving my time! 1 of 3 people learned something from this entry. Congratulations, Kiri. You are awesome. I didn’t know the triathlon was this weekend. Congratulations! What an accomplishment, especially considering all you’ve been through with yours knees this year. I hope you’re enjoying a lazy Sunday recovering. Congratulations and thank you for being awesome.